A vintage look that is at home in both rustic and contemporary settings. The Yakima recalls the original camp blankets relied upon by early sheepherders in the Northwest. 86% wool, 14% cotton. Dry Clean. Made in the USA. 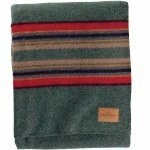 If you have any questions about this product by Pendleton Woolen Mills, contact us by completing and submitting the form below. If you are looking for a specif part number, please include it with your message.